An unidentified night cab operator was in the early hours of Monday killed, when an articulated truck rammed into his car and a Toyota Camry, at the New Benin market in Benin, capital of Edo State. 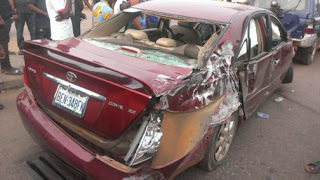 Two occupants of the Toyota Camry, with registration number Edo: BEN 348 FK, also sustained severe injuries in the accident. It was gathered that the accident occurred at 1 am. The deceased was said to have sat on the bonnet of his Audi 80 car with registration number RJ 472 AAA, waiting for night passengers, when the articulated truck which was coming from the 2nd Junction axis, rammed into the two cars, killing him on the spot. When our correspondent visited the scene of the incident, men of the Nigeria Police Force, New Benin Division, were seen removing the vehicles, while the driver of the truck was said to have been taken into custody.